SINGAPORE (Oct 28): UOB Kay Hian is advising Singapore Airlines (SIA) investors to top-slice their holdings before the group reports its 2Q17 results, expectedly on Nov 3. It is keeping the stock at “hold” with an unchanged target price of S$10 and a recommended entry level at S$9. 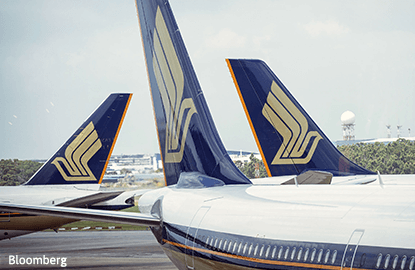 The research house is estimating that the 2Q earnings of Singapore’s flagship carrier will fall by 75% y-o-y due to weaker loads across the parent airline and all of its subsidiaries, weak pax yields, and steeper cargo losses. “Along with weak yields, we expect the parent airline to report a y-o-y decline in operating profit. We also estimate that SIA will declare an interim dividend of 10 cents, unchanged from 1H16’s,” says analyst K Ajith in a Thursday report. He also estimates a further 4% y-o-y decline in the group’s pax yields this quarter, from the 3.7% decline in pax yields reported by SIA in 1Q17. Cathay Pacific on Oct 12 issued a profit warning citing deteriorating business conditions since 1H16 and “heavy pressure on yields”, which has led Ajith to believe SIA’s yields could also have been impacted over the last three months. “Given weakening loads in the Europe and Southwest Pacific sectors, we expect some erosion in [SIA’s] premium traffic loads and yields. Job attritions in the financial sector could also have impacted front end loads and consequently yields,” he adds. For the full year, the analyst assumes that SIA will pay out 65% of its core earnings and 70% of extraordinary item (EI) gains from the sale of SIA Engineering Company’s investment in Hong Kong Aero Engine Services Limited (HAESL). Shares of SIA are trading 1 cent higher at S$10.18.